8 jewelry items. 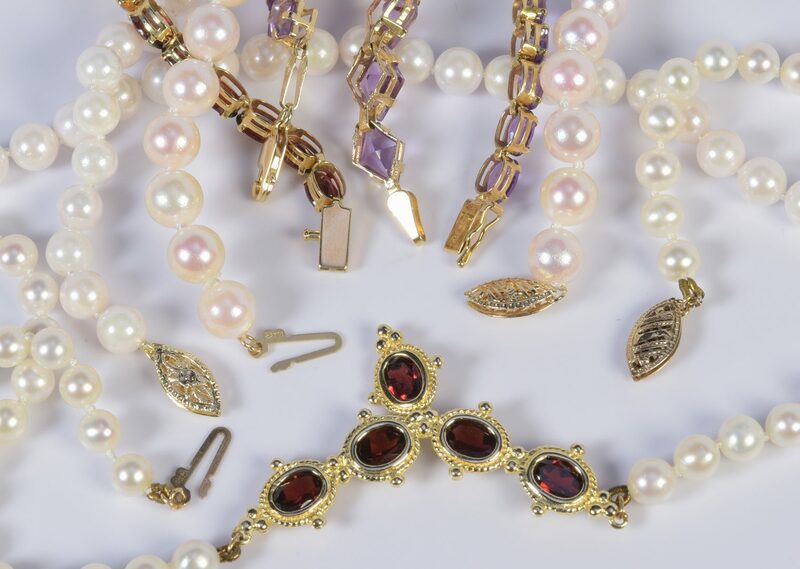 1st group: 14K yellow gold garnet and freshwater pearl set of necklace (17 3/4" L), earrings and ring (sz 7 3/4). 2nd group: Two 14K semi-precious stone line link bracelets (7 1/4" L ea.) and 1 oval blue topaz ring (5/8" H, ring size 7 3/4), 19 grams/3 items. 3rd group: 2 cultured pearl items: 24" L, 5.5 x 6 mm necklace with 14K clasp and 7" L, 6.7 x 6.8 mm bracelet with 14K clasp. CONDITION: 1st group: Good nacre and overall good condition. 2nd group: Very good condition. 3rd group: Thin nacre to necklace, good nacre to bracelet.